The SUNDANCE is clean, stable and safe. She is a 26 ft. Fortier, 10' wide, powered by a reliable 200HP Volvo diesel engine. She has comfortable space for the whole family. You can sit out in the open sea air on our trademark red bench, or take shelter from the sun and wind in the wheelhouse where you can watch the Captain run the boat and learn about the navigational equipment. SUNDANCE meets or exceeds US COAST GUARD safety requirements every year. She is fully equipped with the latest electronics, including Loran, GPS, Color Fish-Finder, Autopilot, and VHS Radios. And, of course, she carries an Emergency Radio Beacon and Life Jackets for everyone on board. There is also an on-board toilet. CAPTAIN STORY FISH -Yes, That's His Real Name! is a former U.S. Coast Guard officer with a license to Captain up to a 100-ton vessel. He has traveled the world on underwater search and survey jobs where he managed sophisticated sonar equipment. He has worked on boats in waters off Chile, Ecuador, Taiwan, Turkey, Nova Scotia, Newfoundland and Vancouver. This makes him familiar with all types of boats as well as all kinds of weather and water conditions. He has lived near the ocean most of his life, and has fished in Chatham waters for over 30 years. 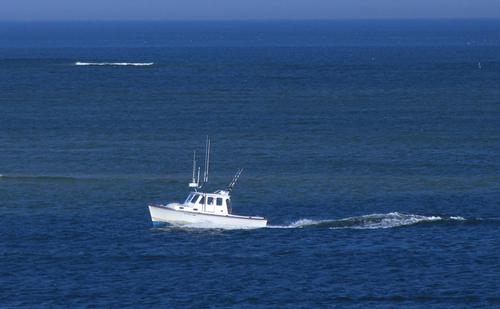 He enjoys teaching people about the sea and fishing, and has extensive knowledge about the unique waters off Chatham.